Shirts With Random Triangles: Auburn AD Jay Jacobs floats idea of moving Georgia-Auburn game to earlier in the season. Auburn AD Jay Jacobs floats idea of moving Georgia-Auburn game to earlier in the season. 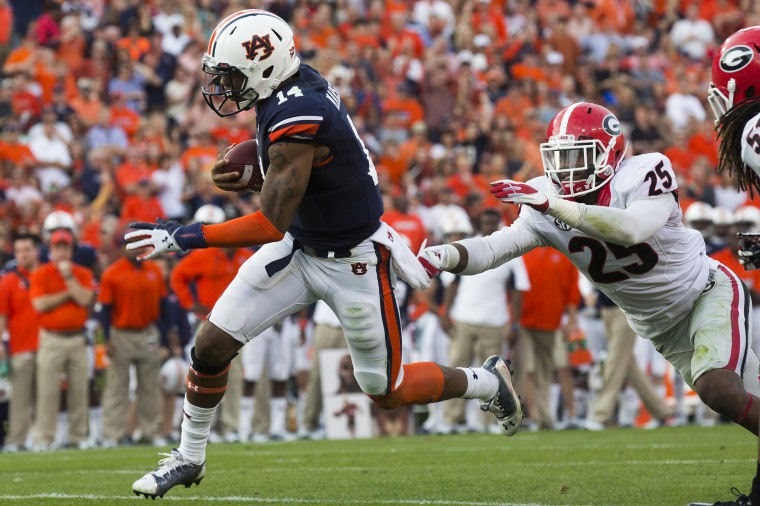 Nick Marshall (14) and Josh Harvey-Clemons from 2013 Georgia-Auburn Game. Photo via Opelika-Auburn News. The Deep South's Oldest Rivalry between Georgia and Auburn is safe and secure, thanks to the SEC's decision to stick with permanent cross-division rivalries. What may be up in the air is when it gets played. Auburn Athletic director Jay Jacobs floated the idea of moving the game's traditional mid-November date to a place earlier in the season. "In the perfect world, I'd prefer to have another game at that back end, whether it is was Texas A&M or moving Georgia up, whatever it may be," Jacobs said at the SEC spring meetings this week. "But it's hard to argue with 2013. It worked out for us having those games at the end of the year." Georgia head coach Mark Richt says that the idea is a new one to him. "I haven't looked at it, so I really don't know," Richt said. "I think you're always going to have back-to-back games of great opponents. It's just inevitable, I don't think you can help it." Georgia-Auburn is traditionally played two weeks before the two schools play their in-state rivals (Georgia Tech and Alabama) to close out the regular season. Any changes probably won't happen anytime in the foreseeable future, and would probably require shuffling the two school's other conference games around, shattering the SEC's fragile equilibrium.